As many Texans climb into bed tomorrow night and the sun moves directly over the Tropic of Capricorn at precisely 11:30 PM Central Standard Time, we’ll turn the corner on the shortest day and longest night of 2011. It’s the Winter Solstice. From here until mid June, the days will get longer. Spring marches our way–something to celebrate. Some folks will bake Christmas cookies. Others will craft tamales. And some of us will combine soil, clay, water and seed–with a generous dash of chile pepper–to make seedballs. Introduced in the 70s, seedballs are a form of “guerilla gardening” whereby seeds, soil and clay are mixed together into tidy germination bombs that are said to have an 80% higher success rate than simply broadcasting seeds onto soil. Adding red potters’ clay to the mix protects the seeds from being blown away by wind or consumed by insects or birds. Generally, seedballs don’t require watering and you should NOT bury or plant them. Simply toss them in a vacant lot, your front yard, or a wildscape situation like a ranch or roadside. Wait for the rain to melt away the clay casing, and nature will do the rest. 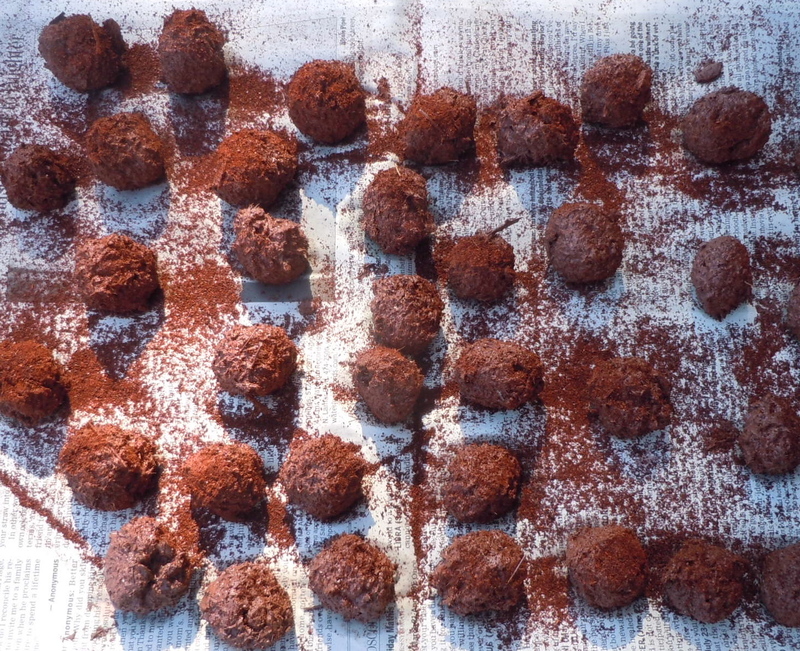 Seedball recipes vary as much as those for Christmas cookies. Some seedball aficionados recommend a 3:2:1 ratio of soil, clay and seed, adding nutrient rich ingredients like worm casings or other natural fortifiers. The Lady Bird Johnson Wildflower Center encourages a concotion that includes sifting, humus with good bacteria intact, your local soil, and sand. I’ve had great success using three parts local or potting soil, 1-2- parts red potter’sclay powder (purchased from a pottery supply) and 1 part seeds. The clay binds the ingredients and keeps the balls intact. Add water until you get a workable dough that allows you to roll spoonful of seedball mix into a ball that doesn’t stick. Put them on newspaper to set up and then add my secret ingredient: red chile pepper. The pepper discourages insects and birds from denigrating or eating the seeds, giving them a higher chance at germinating. If you find that your seedball dough is too watery, just wait. The soil soaks up the excess liquid with time. Once the seedballs set up, usually after 24 hours, store them in paper bags for later use or toss them right away. Remember to use only native seeds for wildscaping situations. Good luck and let us know how it goes. 2. Mix soil, clay and wildflower seeds together in bowl. Mix well. 4. Pinch off or use spoon to grab gumball-sized amounts of the mix. Roll between your palms to get round form. Drop onto newspaper covered cookie sheet to dry. 5. Sprinkle generously with red chile pepper. Let set for 24 hours. 6. Toss and wait. Nature will do the rest. And by the way…chili pepper does not discourage birds in the least. They do not have the receptors for capsaicin. Mammals is a different story…so it might be a good idea to keep mice from enjoying the contents of the seedballs. I’m wondering if the clay is really necessary, or if some other binding ingredient that might break down easier might not be better. Here in New Mexico, the heat, wind and dryness delays any breakdown of seed balls, and basically what you’re recommending is a recipe for adobe. Any ideas for seedball recipes for the desert SW? I live in San Antonio, TX. Where can I buy milkeed plants, or seedballs? Or can I order them from you? Just saw the comment above about making seed balls the size of a marble, otherwise it would take too much rain to break down the soil. If only those instructions were posted everywhere! I made lots of seed balls from native wild flower seeds last Fall and they were bigger than a marble and they did not break down, so seeds didn’t sprout! Now I know why! This could be really frustrating for children if they don’t see flowers blooming after they make these. I will remember this next year! I like your tip about the pepper too! I need a harmless remedy for aphids. I sprayed my milkweed plants with a mixture of water and dish detergent which did keep them at bay but I haven’t been able to get rid of them completely. Any suggestions? I added some vinegar. It kills off the little buggers for a while but you will have to do it over and over all summer long. If I start out with milkweed seedlings in the spring,how will vinegar affect monarchs laying eggs?If eggs hatch,then how does keeping the milkweed plants free of aphids affect the next stage? Hi there! Thanks for promoting this powerful no-tills technique. Milkweed does very well in seed balls, so I think that they can be a good part of restoring milkweed to our plant communities. They are very easy and inexpensive to make, as you describe, and so I think most anyone should give it a try! I agree with Native Seeds about the size and number of seeds in a seed ball. I have a lot of information on my website here: http://seed-balls.com/how-to . Including a discussion about calculating the right number of seeds based on germination rate, if available. Although it is a small point, birds either don’t taste or mind the hot chili pepper. They don’t have the same receptors that make chilis burn us. (in fact people often feed red and hot peppers to canaries to enrich their colors, which they seem to love!) Other mammals, do feel the heat, however, so adding chili powder would likely discourage mice. Having less seeds in the seed ball makes them less attractive to birds as well. PS, I really enjoy this website. Great information, well written, well cited, current, topical. NICE JOB! Thanks, Emily. Great tips on the size and seed density. Hadn’t heard that, and makes sense (and more seedballs will result if you make them smaller with less seed). Wow, 500 seedballs per night–very impressive! Thanks, Ken. No chocolate, but the birds and ants sure like them.